The Air Quality Action Group from PHIL 316 will be presenting information on Evansville's air quality from 11:00 am to 1:00 pm in Ridgway University Center today. Information about resources for determining air quality--from apps to indicator plants--will be provided. Anyone who stops by the table will have a chance to win one of two air purifying plants that will be raffled off. Stop by to learn more! The Department of Music continues its concert season this Tuesday in Wheeler Concert Hall at 7:30 p.m. with a performance by the Department’s resident string ensemble, the Eykamp String Quartet. Quartet members include violinist and Evansville Philharmonic Orchestra Concertmaster Robert Anemone, violinist and EPO Associate Concertmaster Alicia Choi, EPO Principal Violist Rose Wollman, and EPO Principal Cellist Kirsten Jermé. The program will begin with Haydn’s String Quartet in G Major, Op. 76, No. 1. The ensemble will then perform Béla Bartók’s String Quartet No. 2, and the program will conclude with Felix Mendelssohn’s String Quarter in E Minor, Op. 44, No. 2. The Eykamp String Quartet is made possible by the special underwriting of Rita, Richard, and Dorothy Eykamp, friends of the University of Evansville and the Evansville Philharmonic Orchestra. Visiting Assistant Professor and Director of Orchestral Activities Jessica Morel will conduct the UE String Ensemble in its Fall Concert in Wheeler Concert Hall on Thursday, November 19, at 6:00 p.m. The program will begin with a performance by the UE String Trio, a student ensemble consisting of violinist Sarah Lee, violist Taylor Farlin, and cellist Kaitlyn Lowe. The trio will perform works by Sir Edward Elgar and Haydn. The full String Ensemble will then follow with performances of works by Alessandro Scarlatti and Gustav Holst. Both concerts are free and open to the public. Are you looking for Christmas gifts that will also help a good cause and are fair trade? Students from Marketing 325 will be selling products from Uncharted International, a not-for-profit organization that supports adult, orphan women and children from Myanmar, Central Asia, China, and the Middle East who have survived Human trafficking rings or were saved from being trafficked by being in an orphanage. The organization was founded to help those in poverty have hope for a future. All products are handmade by Myanmar women and 90% of each sale will pay the salary of the woman that produced that product. Some of the items that will be sold are blankets, headbands, wallets, jewelry, and more! Wednesday, November 18 from 10:30 a.m.-1:00 p.m.
Thursday, November 19 from 12:30-3:00 p.m.
For more information about Uncharted International visit unchartedinternational.org. The UE Bookstore is offering 20% off the original price of all hooded sweatshirts purchased in the store between November 16 and 20. Stop in and save! This Wednesday, I-House features a segment on Cuba followed by a sing-along of canonical and traditional songs of Spanish America led by the students of the Intro to Hispanic Culture: Latin America class. If time allows there will be a short salsa dance workshop to end the session. There will be refreshments, so come out to I-House and get revved up for International Bazaar on Friday! Make sure you come out at 7:00 p.m., to the usual place on the second floor of Ridgway University Center to hear about Cuba and sing some fun songs in Spanish! The Department of Art would like to announce the second exhibition in the Senior Showcase series for 2015. The students participating are Hali Martin, Bethany Boeglin, Lelia Dant, Emily Kern, and Aryeh Lax. 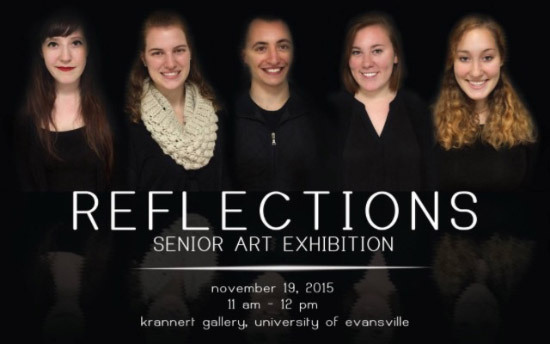 The opening reception is scheduled for 11:00 a.m. to noon on Thursday, November 19, in Krannert Gallery. This event is free and open to the public. Please stop by to meet the artists and view their artwork. 29th Annual International Bazaar Tonight! The best part of the year - the International Bazaar - is tonight! The event is from 5:00 p.m. to 8:00 p.m., with the student preview at 4:30 p.m. and food being served until 7:00 p.m. Visitors to the bazaar will have the opportunity to experience the food, customs and cultures of UE’s international students, a diverse group that represent 51 countries. There will be all-you-can-eat cuisine, music, games, dancing, photo opportunities, and more. The event is open to the public. General admission is $10. UE students and children five and under will be admitted for free. Proceeds from the event will benefit Soles 4 Souls, an international not-for-profit organization that donates shoes for people in need. Guests will receive $2 off admission if they bring a pair of shoes for donation. The bazaar is part of the University’s celebration of International Education Week. To learn more about the bazaar, visit www.evansville.edu/iew or contact the Office of Cultural Engagement and International Services at 812-488-2279 or ms331@evansville.edu. Research paper coming up? Join us this Wednesday, November 18, at 5:00 p.m. in the Writing Center for some help with citation. This final workshop will cover how to format and cite papers according to the APA and CMS style manuals, including the cover and reference pages, internal citations, running heads, footnotes, and endnotes. Changemaker Challenge's Team E^3 and Dr. Kazee’s polar bear appearance are featured in the Evansville Courier & Press. The article is on the front page of the Making the Grade/Classroom section with color photos. You can read the article here. Want to learn more about the religions of the world and immerse yourself in religious culture? Do you have a desire to engage with people who are different than you? Interested in sacred spaces and how they reflect and shape religious beliefs and practice? 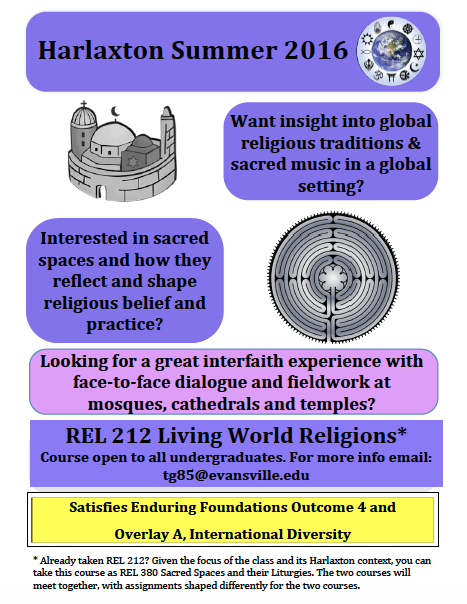 If you are looking for a unique interfaith experience with fieldwork at mosques, cathedrals, and temples, REL 212 "Living World Religions" at Harlaxton is for you! Sign up today for summer at Harlaxton 2016! Satisfies Enduring Foundations Outcome 4 and Overly A. If you've already taken REL 212, you may take this course as REL 380, "Sacred Spaces and Their Liturgies." The two courses will meet together, with assignments shaped differently for the two courses. The University of Evansville Honorary Degree Committee is now soliciting your recommendations for honorary degrees to be conferred at the May 2015 Commencement. We need your help in selecting accomplished individuals to receive one of our university’s highest honors. According to the UE Faculty and Administrator Manual, the committee is charged with requesting and reviewing honorary degree nominations made on the basis of individual service to the University and individual achievement. An honorary degree may also be awarded to individuals who exemplify the University’s mission. Selected persons have excelled in a variety of areas--law, medicine, education, business, literature, politics, and entertainment. Last year’s recipients were UE Professor Emeritus of Chemistry Jean Beckman and the Honorable Lee Hamilton. The committee looks forward to receiving your recommendations. We need YOUR help for International Bazaar on November 20! Follow the links below to volunteer for specific slots - either the night-of or days before the Bazaar. Volunteers are especially needed to chalk sidewalks and boards on Friday. Volunteering slots are set up in short time-frames to make sure you will be able to fully enjoy the 2015 International Bazaar experience! In addition, you may log your hours as volunteering as the proceeds of the event go to Soles 4 Souls. If you have any questions contact aa354 or as564. The daily mail run will begin at 8:30 a.m.
All outgoing mail must be in UE Mail Services for processing on November 25, no later than 10:00 a.m. Please note that the USPS will also be closed on Thursday, November 26th for Thanksgiving Day. While UE Mail Services is closed, those needing to mail a letter, etc. later in the day may do so by taking their mail to the Post Office and paying for the postage via a UE Pcard. The last day to ship UPS Ground packages for the week of Thanksgiving from Mail Services is Tuesday morning, November 24. UPS is closed on Thanksgiving Day for pickup and deliveries. On Friday, November 27, there is UPS delivery and pickup of air and international packages only. Pickups are available if you have made pre-arrangements with UPS by Wednesday, November 25 or via UPS On-Call Pickup service and at all UPS Drop Boxes. Please note that guaranteed delivery confirmation times will be extended 90 minutes on Friday. For urgent shipments, UPS Express Critical is available 365 days a year. For more information on this services go to www.expresscritical.com. For mailing questions, contact Mail Services at extension 2197 or mailservices@evansville.edu. • The daily receiving run will begin in the morning at 10:00 a.m. on Wednesday, November 25. • UE Central Receiving will close at noon on Wednesday, November 25th and re-open on Monday morning, November 30. • Please note that campus offices expecting packages are asked to notify Central Receiving for possible alternatives. • Offices that plan to be locked earlier than noon on November 25 due to employee vacations are asked to notify Central Receiving in advance to avoid unnecessary morning deliveries. Join our campus social initiative! Have you heard about events like the Changemaker Challenge? Do you have a passion for social innovation? Then you may be interested in some of the open positions in the Social Innovation Club! If you would like to know more about any of these positions, then please let us know and we can send you the job description! Contact ll115@evansville.edu or po22@evansville.edu or stop by the Institute for Global Enterprise for more information! Lisa Kretz, assistant professor of philosophy, delivered a paper titled "Thinking About Bias" based on the collaborative research that she and Matthew Knoester, assistant professor of education, performed in the spring of 2015. It was presented at the Indiana Philosophical Association conference that occurred November 13 -14 in Richmond, Indiana, at Earlham College. Erin and Mitch Lewis have welcomed a newborn daughter to the world! Mackenna Diane Lewis made her debut on November 15. She was 6 lbs., 13 oz., and 50.8 cm. long. Erin is the program manager at the Institute for Global Enterprise. Jeffrey Braun, chair of the Physics department, is Mackenna's proud grandfather! UE students Andrew Nunn, Michelle Sonnenberger, and Matt Roberts will present the results of their research on the effects of deer browsing on tree diversity at Wesselman Woods Nature Preserve on Tuesday, November 17 at 7:00 pm at the Wesselman Nature Center in Evansville. The trio did their research under the guidance of Cris Hochwender, professor of biology, during the summer of 2015. The Evansville Audubon Society has monthly conservation and education programs and this program should be of particular interest for all who have visited the Nature Center and walked the trails. Come and support these UE students on Tuesday evening. Junior Sara Dickey scored 25 points while freshman Kerri Gasper poured in 20, but Baleigh Reid scored a game-high 29 points to lead the Miami RedHawks to a 91-85 victory over the University of Evansville women’s basketball team on Monday evening at Millett Hall. Dickey nailed five triples for the Purple Aces (0-2) and hit eight shots overall. Gasper was 6-of-13 from the floor and hit four triples. Camille Coleman recorded 17 points while Aaliyah Gaines finished the night with ten. Reid paced the RedHawks (1-1) with her 29 while Ana Richter notched 19 and Leah Purvis recorded 17. Down 2-0 in the opening minute, Camary Williams opened the scoring for the Purple Aces with a triple to give UE its first lead of the game at 3-2. Evansville’s first four buckets of the night came via the long ball as a second trey of the night for Sara Dickey gave the Aces a 12-8 lead less than four minutes in. Camille Coleman hit a layup with 36 ticks left in the first quarter to give UE its largest lead at 22-16 before Miami scored to make it a 22-18 game at the first break. The second quarter was all RedHawks as they outscored UE by a 22-12 margin to take a 40-34 lead at the break. Miami continued to lead throughout the third stanza as a triple gave them their largest lead at 54-45 with 19 ticks left in the period. Laura Friday hit a jumper in the last two seconds to get UE back within seven. Out of the 3rd quarter break, Evansville came out of the chute fast, going on an 11-2 run to take a 58-56 lead. Dickey and Gasper each had a triple in the rally. The lead for UE reached six at 66-60, but the RedHawks fought back as a Leah Purvis jumper tied it up at 69-69 with 17 seconds remaining. The Aces did not get a shot off on the ensuing possession, sending the game to overtime. In the first two possessions of the first OT, the teams traded 3-pointers, setting a tone for the extra session. With 33 seconds left, the RedHawks hit a triple giving them a 79-76 edge. Down to its last possession, UE countered as Dickey nailed one of her own and the game went into a second overtime period. Back-to-back MU baskets saw them take an 85-81 lead in with 1:43 left in double overtime. Evansville cut it to two on two occasions, but Miami had the late answer and held on for a 91-85 win. Evansville played tough despite being outrebounded by a 57-27 tally. Miami also finished with a 22-6 advantage on the offensive glass. Four RedHawks notched seven or more boards. The Aces finished the night shooting 41.8% while Miami shot 48.2%. The trip through the state of Ohio continues for UE as they head to Cleveland State on Wednesday. The Aces face the Vikings in a 6 p.m. CT contest. - INFO: For all of the latest information on University of Evansville athletics women’s basketball, log on to the sport page on GoPurpleAces.com or follow the program on Twitter via @UEAthletics_WBB. - DONATE: For information on giving to UE Athletics or its individual athletics programs, visit the DONATE tab on the top of GoPurpleAces.com. - TICKETS: To purchase tickets for University of Evansville athletics events, log on to GoPurpleAces.com and click on the TICKETS tab on top of the page. University of Evansville senior Egidijus Mockevicius has been named the Missouri Valley Conference Player of the Week in an announcement by the league on Monday afternoon. In Sunday’s season opener, Mockevicius showed just why he earned a spot on the MVC Preseason All-Conference Team. Mockevicius hit 7 of his 11 shots to finish the game with 18 points. He hauled in 14 rebounds with 10 coming on the defensive end and also added six blocked shots and a steal. For Mockevicius, it marked his 28th double-double in the last 45 games. His final of six blocks ties his high since the beginning of last season and was second-most in the nation in the opening weekend of play. This is the second MVC Player of the Week honor for Mockevicius, who also was recognized on December 22, 2014. Mockevicius and the Aces are set to take on Marian at the Ford Center on Tuesday night beginning at 7 p.m.
- INFO: For all of the latest information on University of Evansville athletics men’s basketball, log on to the sport page on GoPurpleAces.com or follow the program on Twitter via @UEAthletics_MBB. Fresh off of an 80-65 win in the season opener against Southeast Missouri State, the University of Evansville men’s basketball team will be right back in action this evening versus Marian at 7 p.m. inside the Ford Center. In Sunday’s season opener, Purple Aces senior Egidijus Mockevicius showed just why he earned a spot on the MVC Preseason All-Conference Team. Mockevicius hit 7 of his 11 shots to finish the game with 18 points. He hauled in 14 rebounds with 10 coming on the defensive end and also added six blocked shots and a steal. His final of six blocks was the second-most in the nation in the opening weekend of play. Senior D.J. Balentine had a “quiet” 20-point game against Southeast Missouri State in Sunday’s opening game. Balentine hit 4 of his 14 attempts, but did his damage at the free throw line, downing 10 of his 12 attempts. Going back to last season, Balentine has notched at least 16 points in each of his last nine games. Junior Mislav Brzoja certainly enjoys playing in the first game of the season. Last year, Brzoja set his career marks in points and rebounds with 21 points and 11 boards on a 10-of-12 effort against Earlham. It was his lone double-double of the season. This year, Brzoja was at it again versus SEMO, setting a career-high with 12 rebounds while scoring 16 points. Led by former Aces assistant Carson Harris, Marian comes to town sporting a perfect 5-0 record. Most recently, the Knights defeated Shawnee State (Ohio) by a final of 73-56 on Saturday. Nick Painter has been the top scorer for Marian, recording 16.6 points per game. He is one of five to average double figures. Just behind him is Wesley Stowers, who checks in at 15.8 PPG. Following Tuesday night’s match, the Aces are back home on Saturday as they welcome Belmont for a 12:30 p.m. game. Prior to the game, the annual Fan Fest will be held just outside the Ford Center from 10:30 a.m. until the start of the game. It will be held on Freedom Plaza.